bebop spoken here: !STOP PRESS! Ruth Lambert Turns "Flapper" with The New Century Ragtime Orchestra! !STOP PRESS! Ruth Lambert Turns "Flapper" with The New Century Ragtime Orchestra! 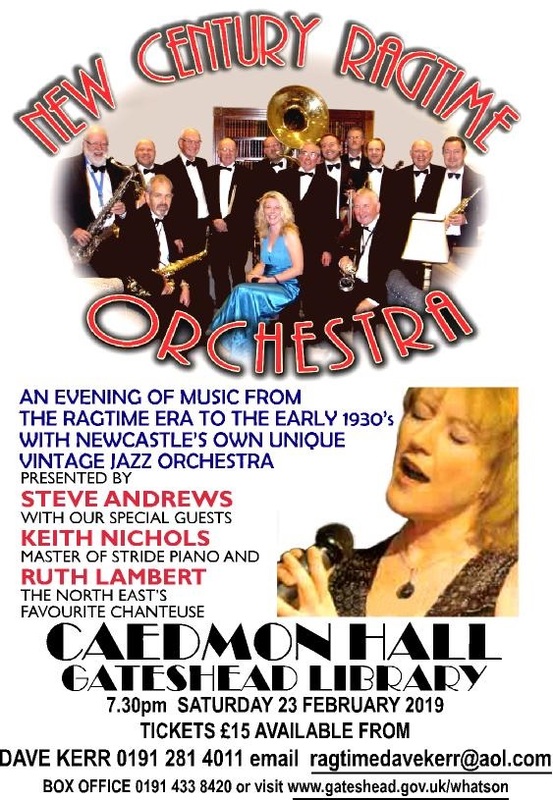 For one night only, at Caedmon Hall, Gateshead, on Saturday, 23rd February, the New Century Ragtime Orchestra are delighted to welcome as their special guest, fabulous vocaliste Ruth Lambert. Ruth is well known to audiences in the North as a superb jazz singer who is much prized for her interpretations of great songs both past and present. Her appearance with the NCRO will guarantee that her hard-won reputation is irretrievably ruined - after all, who can remember the band's previous vocalists: Ella Fitzpatrick, Billie Hollyhocks, and Doris Dray? Not to mention Dean Morton and Tony Burnett! The NCRO - the band of whom Duke Ellington said, "Who?" - will once more be featuring our great friend Keith Nichols on piano and vocals, and performing a vast range of hot, sweet and swinging tunes from the golden age of Jazz, Ragtime and Swing between 1900 and 1940. We're told that Steve Andrews will, in addition to his duties as M.C. and quality controller for the band's whisky, be taking along his tenor saxophone and clarinet - in the profound hope that he won't actually play them! - and that he has a new joke (shurely shome mishtake? ed.). We'd love to see you all there for another annual Festival of Fun and Frolic at Caedmon Hall. Tickets are available from Dave Kerr (see poster for details) and from Caedmon Hall itself - book early to avoid disappointment!